Fireflies communicate with one another using bioluminescence, a phenomenon found in numerous animals and insects. By glowing, these fireflies are capable of relaying complex information such as mating interests and details about food location. Their brilliant flashes also function a way to bolster group cohesion. By varying the frequency and color, fireflies are able to deter predators and even attract new members with the hope of growing their swarm. Despite these interaction occurring locally, the light show resulting from a swarm of fireflies is certainly magnificent. Each firefly works to sync up with their neighbors and, over time, a dynamic and evolving pattern can be observed. This emergent behavior is also seen in other biological interactions including flocks of birds and schools of fish. This installation strives to mimic the emergent behavior of fireflies. 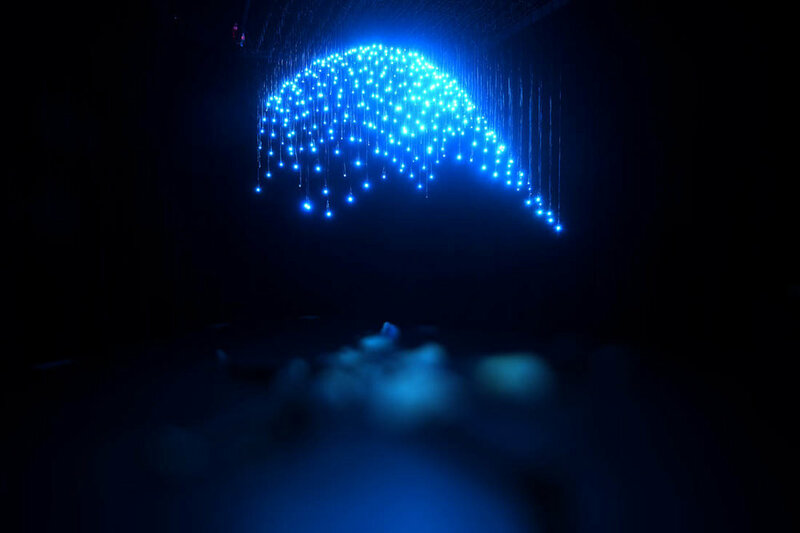 Comprised of 400 LEDs that hang from a canopy, a brilliant light show develops as a result of simple local interactions. Each LED here represents a firefly and tries to sync with its neighbors. In the beginning, the fireflies appear to blink randomly, but as time passes, they blink in harmony. The installation resets itself periodically back to random blinking, before finding a new pattern and synchronicity. In collaboration with Jackie Cameron, Michael Skirpan & Felix Vietmeyer.